These is a picture of workers packing cotton into thick material to make a mattress. Such shops are common in all the cities and town of India. Cotton mattresses are comfortable to sleep on but unfortunately lose shape quickly. Re-packing them after treating the cotton inside is the common practice after a few years. 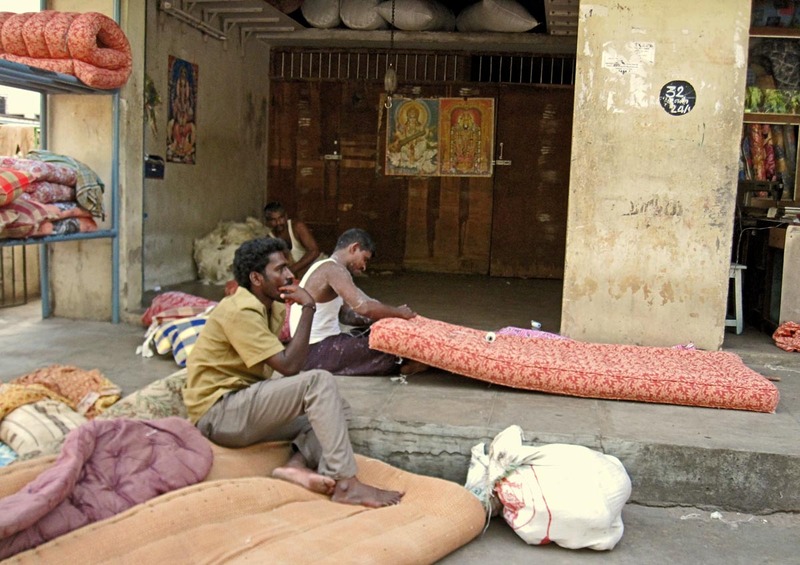 Cotton mattresses are now out of style in developed countries, and have been so for more than a century. Spring mattresses are popular. Rubber, foam, coir are all used today but in poorer countries cotton mattresses are still used as they are cheaper. Production of cotton mattresses is a labour-intensive activity.